I have an idea. Let’s take one of the best actors in the industry, Benicio Del Toro and have him play a role where it is based off of the most infamous drug lord, Pablo Escobar. So let’s make that story the background to a love story fabricated for the sake of the movie to move it along with a questionable male lead in Josh Hutcherson. Basically, this movie is waste of Del Toro’s talents. Plot: In Colombia, a young surfer meets the woman of his dreams - and then he meets her uncle, Pablo Escobar. What a dumb plot. Why not make it an Escobar movie? Pros: There a certain sequence that is a good cat and mouse scene that’s add legitimate tension and suspense, but other than that, I can’t say anything more positive about the directing. Cons: First off, this is a dumb title for a film and it sounds like the sequel to the actual Escobar film and the sequel is being produced by the SyFy channel. Secondly, when you have Benicio Del Toro as Pablo Escobar, do not focus on a love story with the two lovers having the chemistry of a wet tomato. This film would have benefited from focusing on Escobar more than this pointless love story. And thirdly, the movie ends on an abrupt note and shows a final clip displaying brotherly love. That’s not a problem, but you didn’t even try to set up a good relationship between the two brothers. It was a dull relationship that didn’t add any weight to the film. Pros: I will give credit where credit is due and say Del Toro, when he was on screen, was menacing but also relatable to the audience. Every scene with him and Hutcherson was well done and very eerie to where Del Toro made my skin crawl. Cons: Josh Hutcherson has never worked for me. He is fine in the Hunger Games franchise and that’s about all I can from his career. I have never been open to the idea for him to play a leading character, he just isn’t there yet. The chemistry between him and his girlfriend is not there and it was painful to sit through. 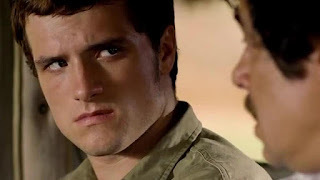 Josh Hutcherson’s character also has a brother in this movie and the acting was bland there as well. Hutcherson only shined when he was with Del Toro. Pros: Despite the bad love story, I can say this is a well shot movie with beautiful scenery and some shots that actually stuck with me for its richness in color, grit and lighting. Cons: …the love story, which was the main plot thread, slowed everything down for me and I just wanted to skip all that and get straight the Del Toro scenes. For as little as those scenes were, they kept me intrigued and didn’t want to fall asleep. Overall: This is a movie to benefit from an actual, and as factual as you can get, biopic of Del Toro as Pablo Escobar and focus primarily on that with some sub-plots thrown in. That’s what my thoughts boil down to. This was a disappointment.